In reinforced masonry, the SPEC MIX® Core Fill Grout is used to fill cells of concrete masonry units and horizontal bond beams as well as the cavities of composite masonry construction. Depending on the project specification, SPEC MIX Core Fill Grout is available in both Fine and Coarse mixtures. 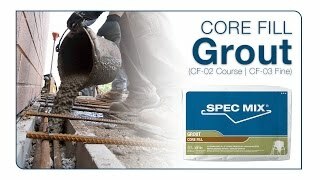 The Core Fill Grouts are a dry, preblended product containing cementitious materials and dried aggregates formulated for superior flow to fill masonry voids and optimal compressive strength while meeting ASTM C 476 requirements for reinforced masonry construction. It is designed as a fluid, cohesive cementitious material used to bond together adjacent masonry units and steel reinforcement in the cores of the masonry units to the masonry assemblage, or to fill reinforced bond beams. Using SPEC MIX Core Fill Grout in conjunction with existing reinforcement will produce a structurally sound final wall system for reinforced masonry construction. SPEC MIX Core Fill Grout is produced under strict manufacturing standards, and complete quality control measures are implemented with each batch. A digital printout displaying the proper proportions per batch may be kept as a permanent record. Each SPEC MIX® manufacturer certifies that SPEC MIX masonry products are designed to meet the project specifications and applicable ASTM and TMS standards. SPEC MIX® Core Fill Masonry Grout is available in 80 lb. (36.3 kg.) packages for easy hand loading or in 3000 lb. (1360.8 kg.) reusable bulk bags to be used with the various SPEC MIX silo systems.